Everyone knows the importance of seeing and being seen when riding your bike. This becomes even more critical when riding at night. You could use several things to improve your safety during your nighttime ride. Having bicycle reflectors and an approved bike lighting are simple fix to the problem. When it comes to reflectors, you could never have too much. If reflectors are not available to you, look around the house for anything that you would be able to use. 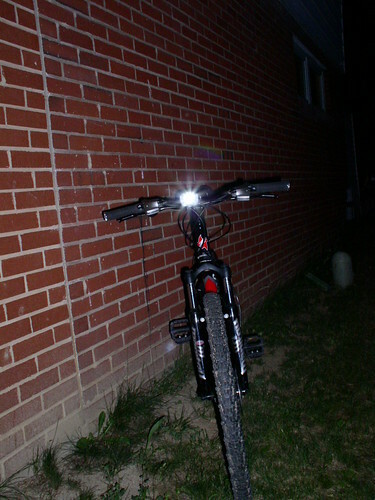 But when it comes to Bike lights, PrincetonTec’s Eos Bike is the way to go. I just love how bright it is. Thanks to Princeton Tec’s Eos Bike, riding in the dark is no longer a problem. After reading for first impression about the PT Eos I decided to pick one up and I used it this past weekend in a 24hour mountain bike race. It was suppose to be my backup light incase myy 20watt halogen died during a night lap. I ended up using it as my primary light during all uphill climbs and flat sections, it was more than bright enough to race with in the less technical sections! Great light! I’m happy to hear that you tried out Princeton Tec’s Eos and liked it. I have nothing but good things to say about this awesome product. If you have pics of you in that race with the lights, I’d love to post it! Sorry, no pictures at night (the pros that do the photography stopped doing night shots a couple of years ago at this race).